Images are usually inspired by traditional Japanese art and nature as well as creatures and characters from Japanese folklore. Images usually consist of: lotus flowers, koi fish, tigers, warriors, waves, cherry blossoms, dragons, war dogs and geishas. Japanese traditional style tattoos traditionally began as a means of conveying societal status as well as serving as spiritual symbols that were often used as a sort of charm for protection as well as symbolizing devotion, not unlike modern religious tattoos. Tattoos in Japanese culture have developed over time as a form of punishment similar to what was seen in Rome where it was common practice to tattoo prisoners of war, criminals and slaves as a means of making their status in society instantly recognizable. The practice eventually faded and tattoos returned as a status symbol among the merchant class who were, interestingly enough, banned from flaunting their wealth. The Emperor of Japan outlawed tattoos following World War II in an effort to improve Japan’s image in the west. Tattoos in Japan then took on a criminal element, but this didn’t prevent foreigners from being so intrigued as to seek out the skills of Japanese tattoo artists—a practice that helped keep Japanese style tattoos alive. The modern association between Japanese traditional tattoos and the criminal element is believed to have led to the adoption of tattoos by Yakuza, the Japanese mafia. This has served to promote the “cool” aesthetic of Japanese traditional design style tattoos as well. Many people proudly wear Japanese style tattoos today for their beautiful artistic merits, flowing composition and the deep meaning associated with the many aspects of Japanese tattoo designs. There are numerous images and symbols utilized in the Japanese style to convey specific meanings. These images are used to convey one’s beliefs, aspirations or character traits. These design elements are called “motifs”. They are intended to have the same meaning wherever they are used so that meaning is not unique to the individual. This means anyone that sees the tattoo can instantly recognize the meaning and what the wearer wants to have conveyed, whether it be personality traits, character attributes or even association with a criminal organization. Traditionally, dragons in the west symbolize strength, ferocity and wealth. While they are considered a destructive force, they are also considered guardians. However, the Japanese, and the east in general, see dragon tattoos much differently. Dragons are considered generous, benevolent forces that use their strength to do good for mankind in Japanese traditional tattoo art. Another trait attributed to dragons is wisdom. These positive connotations have made dragon tattoos among the most popular of Japanese traditional style tattoos. Koi fish are another popular Japanese traditional tattoo design. They are a specially bred type of carp, a fish native to China, where the Koi actually originates. These fish are given masculine qualities in traditional Eastern folklore such as strength and bravery. In China, the Koi were known to attempt to swim upstream in the Yellow River, but very few could swim past a point known as “Dragon’s Gate”. The Koi who were able to pass this point were said to be rewarded by turning into dragons. 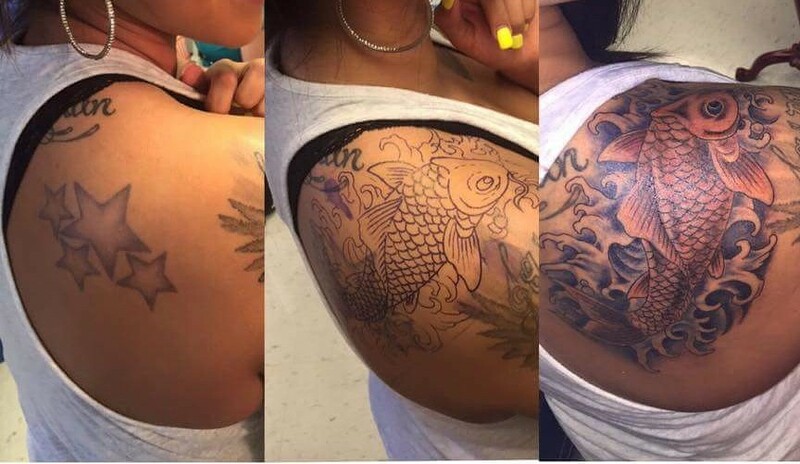 As a result, Koi also symbolize determination and a strong desire to succeed and become “something more”. The tiger tattoo carries with it similar traits that we attribute to the real animal: strength and courage, but also long life. The Japanese tiger tattoo is also used to ward off evil spirits and bad luck, as well as disease. It is a symbol for both the North and for autumn, they are said to control the wind, and they are one of the four sacred animals. The cherry blossom tattoo design is another common Japanese style tattooing. It often depicts falling petals being carried by the wind, reflecting a very unique trait of Japanese culture. They call it “Mono no aware,” which means the pathos things, or more literally, an empathy towards things. This means the cherry blossoms are quite beautiful and delicate, but are not in bloom long. The blossoms are blown from the trees with the slightest wind, which means beauty fades rapidly. This is seen by the Japanese as a metaphor for life which echoes their own mortality. This is just a few of the facts about Japanese Traditional tattoos. Tattoo Consortium can design Japanese Traditional tattoos to any of our clients specifications. For more information or to get started on your next tattoo contact us with the link below! Christopher Martakis liked this on Facebook. Jacob Jones liked this on Facebook. Marcus N Aubrey Vittonel liked this on Facebook. Jon Acosta liked this on Facebook. Justin Sara liked this on Facebook. Lorie Desautels liked this on Facebook. Felicia R Jordan liked this on Facebook. Heidi Michelle liked this on Facebook. Amber Norman liked this on Facebook.